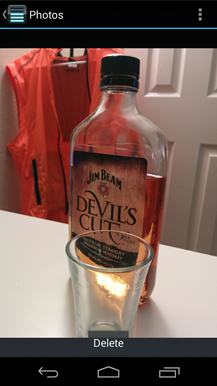 You know what can be fun if done in moderation? Most things, actually. Among those things, alcohol is probably high on the list for most people. While drinking, it's also fun to be able to quantify how intoxicated you actually are – something a little more than "my face is numb" or "Nah, I'm OK – I've only had 12 shots." 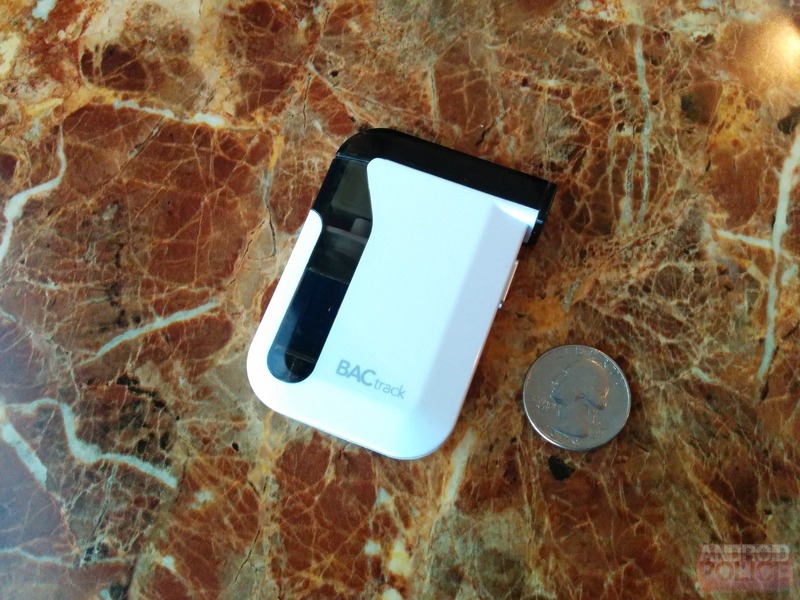 That's where this nifty little Bluetooth breathalyzer from BACtrack ($150) comes into play – it can tell you exactly how drunk (or not drunk) you are in about 30 seconds. Both Artem and I have been playing with this for the last few weeks, and I have to admit – it's pretty cool and could really come in handy for those nights out. 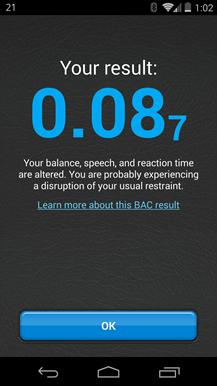 So, just in time for your Friday night debauchery, let's take a look at the world's first breathalyzer to sync with a smartphone. 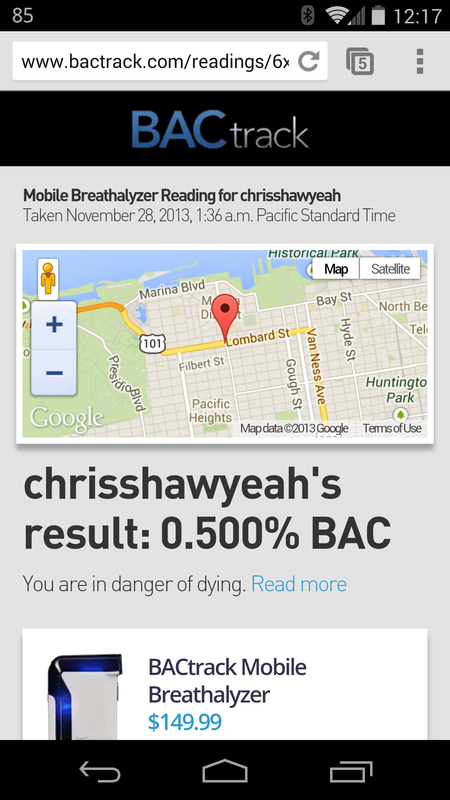 It's a mobile breathalyzer. That's cool in itself. 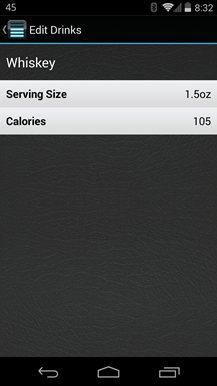 The app is useful, but it could use some work/additional features. Only compatible with devices running 4.3 and above. The hardware itself is pretty simple, so most of this review will be about the app, which is where basically everything happens. Before we get to that, though, let's take a quick look at the unit itself. It's a small, light little thing with extremely minimal buttons – it literally has one, used for turning the unit on and off. A microUSB charging port is on the bottom. 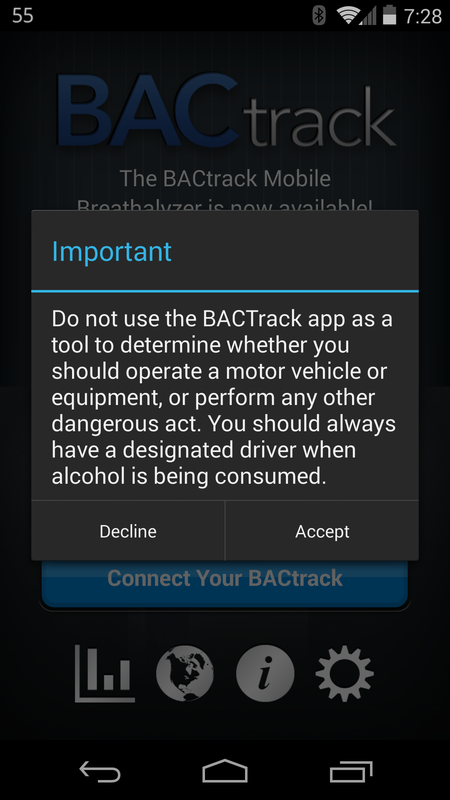 It's incredibly easy to use – turn it on, connect your phone to it using the BACtrack app, and wait for it to give the OK to blow. There's a 10(ish) second burn-off period before each use where it gets rid of any old alcohol residue that may have been leftover from the previous test. 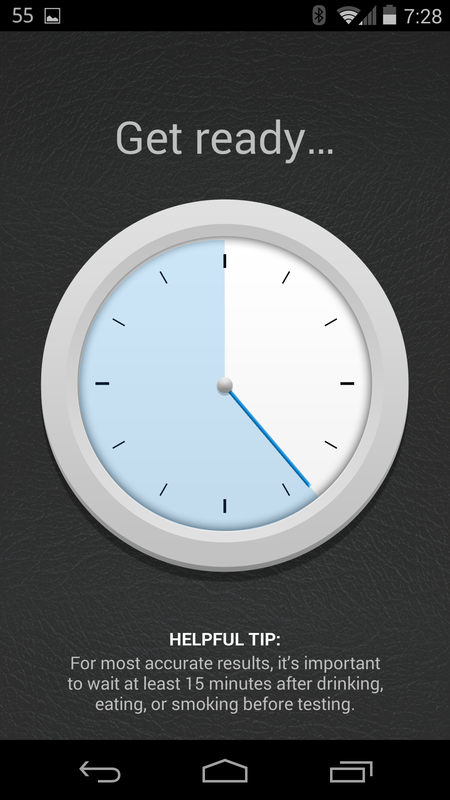 You then have to blow into it for roughly 5-6 seconds (there's an indicator in the app that tells you when to stop); it then does its thing and gives you the results. 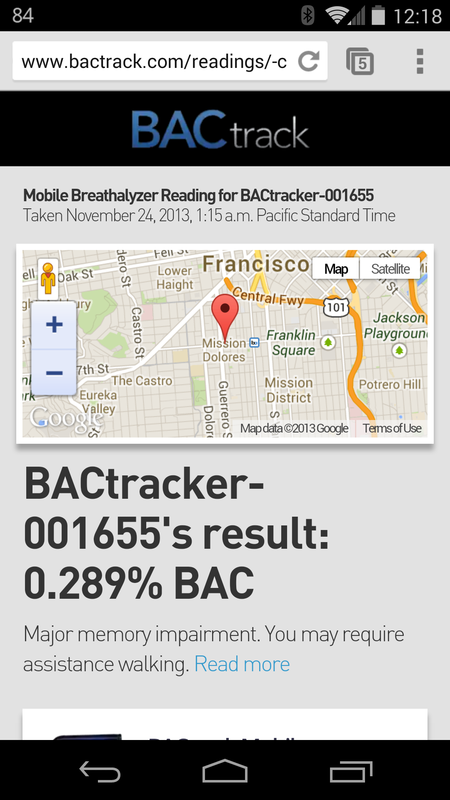 Q: All the smartphone breathalyzers work the same, right? 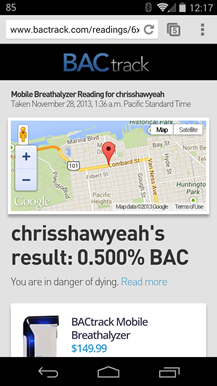 A: All Smartphone breathalyzers are not the same. 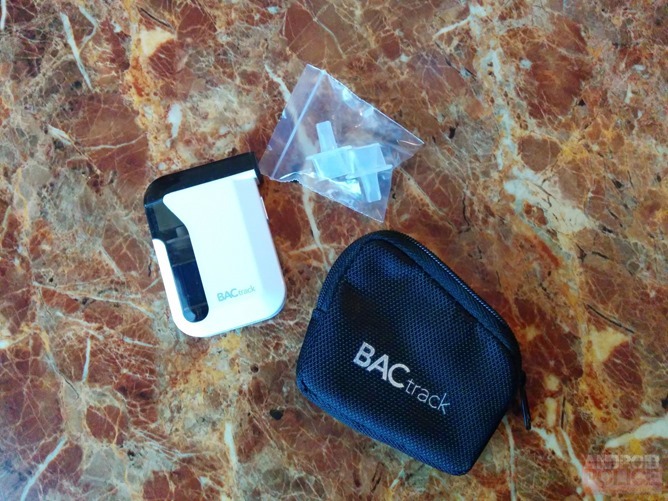 The most important factors to consider when choosing a breathalyzer are the sensor type (fuel cell vs. semi-conductor) and breath sample collection method. Both of these factors are crucial to obtaining an accurate and reliable Blood Alcohol Content (BAC) result, and account for the large variance in the cost of the products. Sensor type: BACtrack Mobile employs Xtend™ Fuel Cell Sensor Technology to maximize accuracy, which is the same technology used in BACtrack’s other professional fuel cell products that are cleared by the U.S. Department of Transportation (DOT) and U.S. Food and Drug Administration (FDA). 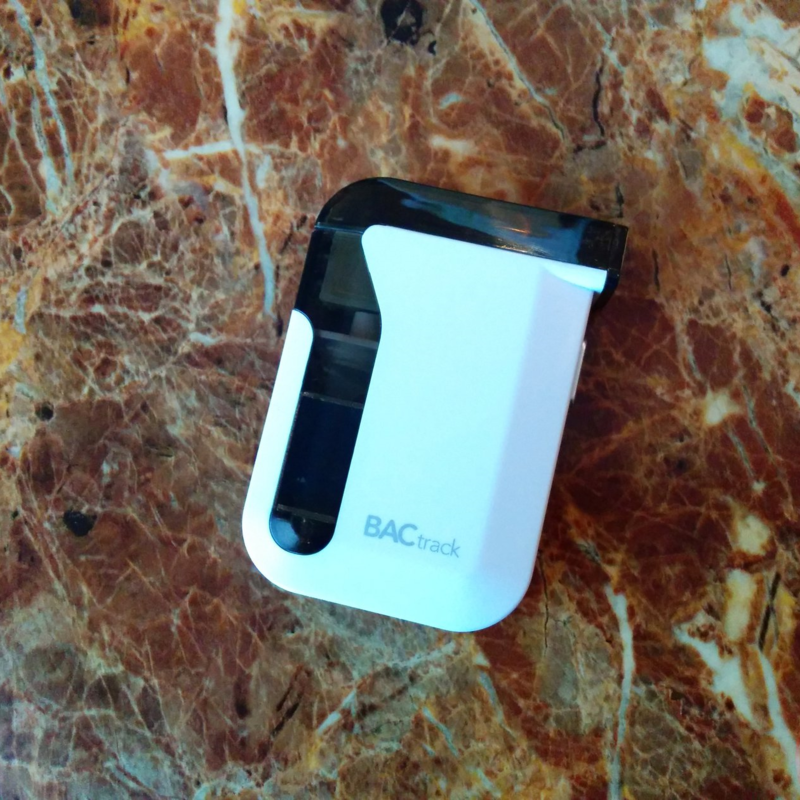 Alcohol fuel cell sensor technology offers more consistent and accurate results over the complete range of alcohol concentrations, from 0.000 to 0.400% BAC, including trace amounts of alcohol, and it’s the gold standard for handheld law enforcement breath testers. BACtrack Mobile is the smallest full-featured fuel cell breathalyzer in the world, and the most accurate of its size. Breath sample collection: Like BACtrack’s other professional grade units, BACtrack Mobile was designed to include a miniature internal air pump to allow for the highest level of precision in collecting a breath sample. During use, the user can actually feel the "click" of the pump collecting the breath sample. In addition, BACtrack Mobile features a mouthpiece in order to accurately control the flow of the user’s breath. 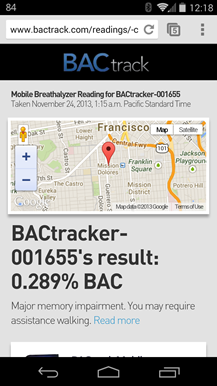 Q: How does a Bluetooth-connected breathalyzer compare with a model that plugs directly in to a mobile phone? 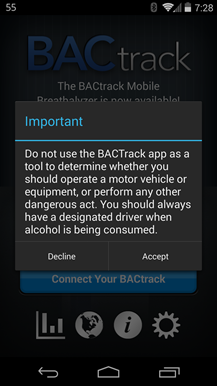 A: Smartphone breathalyzers that plug into a phone are usually dependent upon the location of a headphone jack. Some phones locate their headphone jack at the top of the device, other phones on the bottom. This could make it more challenging for a user to blow into the device at a specific angle, particularly if a user is intoxicated. Additionally, blowing at or near the smartphone can transmit breath alcohol moisture and/or germs onto the smartphone, which could potentially be transferred to other users. 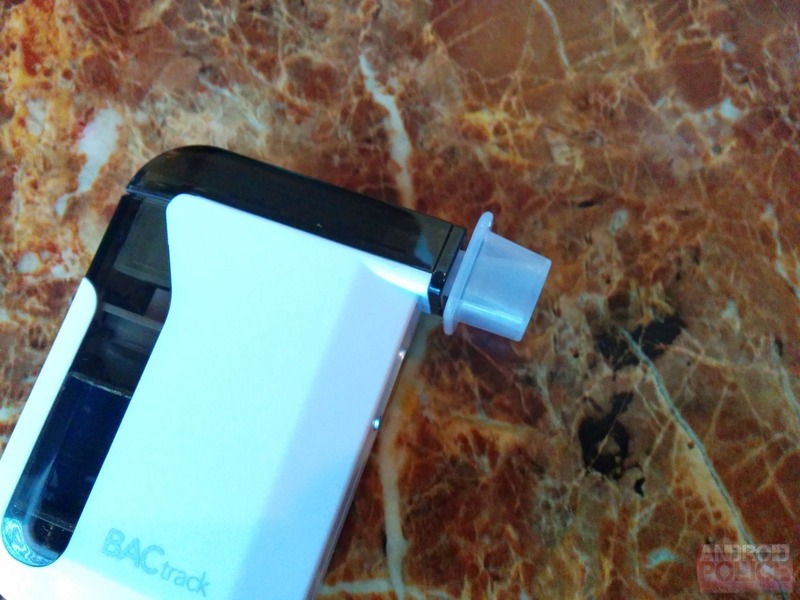 A smartphone breathalyzer equipped with Bluetooth connectivity allows for breath collection in a separate unit with a closed, replaceable mouthpiece. This restricts mouth contact between users, inhibiting the spread of germs, and keeps the smartphone less likely to collect moisture and germs. So, back to the app. Once you accept that you're a responsible adult and verify that within the app, it's all pretty smooth from there. With the device connected, hit the "take a reading" button, wait for the burn off, and blow. 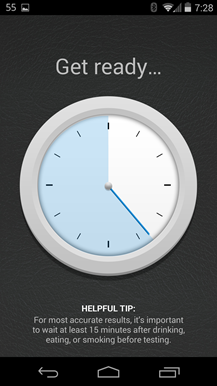 An on-screen indicator will tell you when it's time to stop. 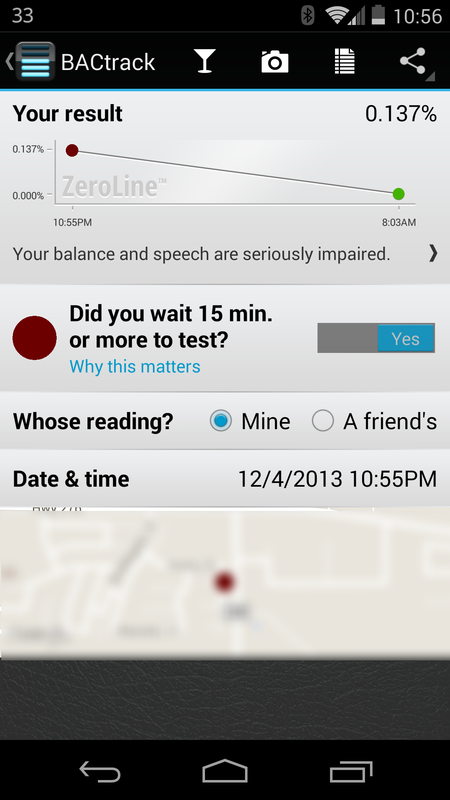 About 15 seconds later (give or take), you'll have a quantified result of how intoxicated you really are. Yay science! 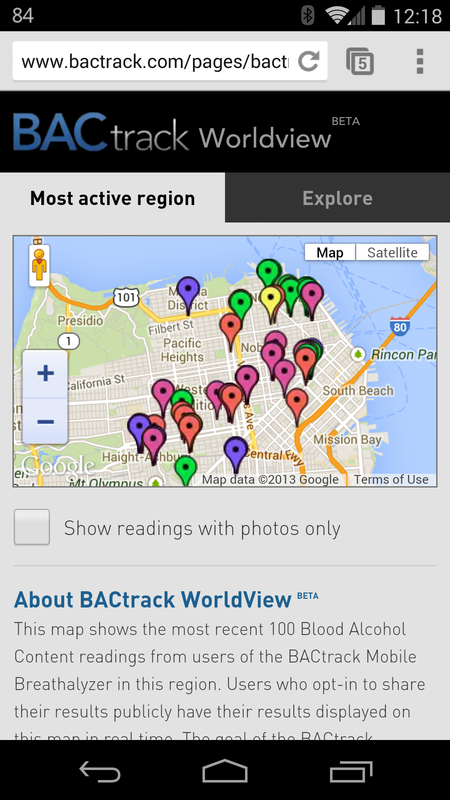 Here's where the BACtrack app really shows what it can do. 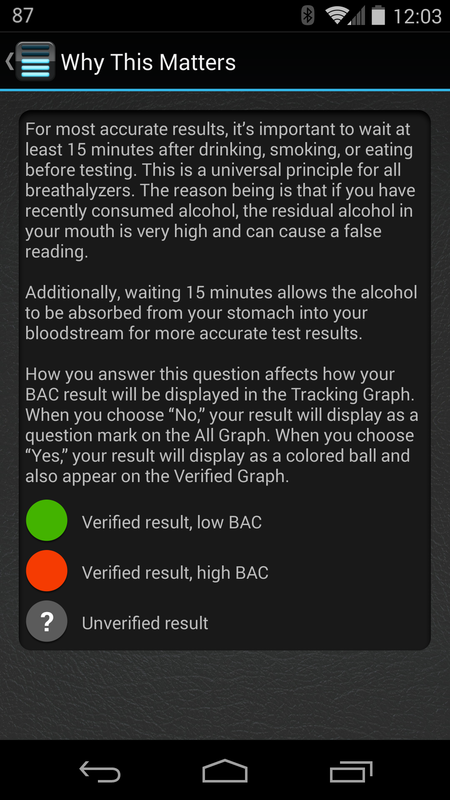 It not only gives your current blood-alcohol reading and brief description of what you're likely feeling, but also gives an estimate of when you'll likely be sober, a way to define whose reading it is (so you can share with friends – it even ships with snap-in mouthpieces so you don't have to share mouth germs with everyone else), and the time/place the reading was taken. 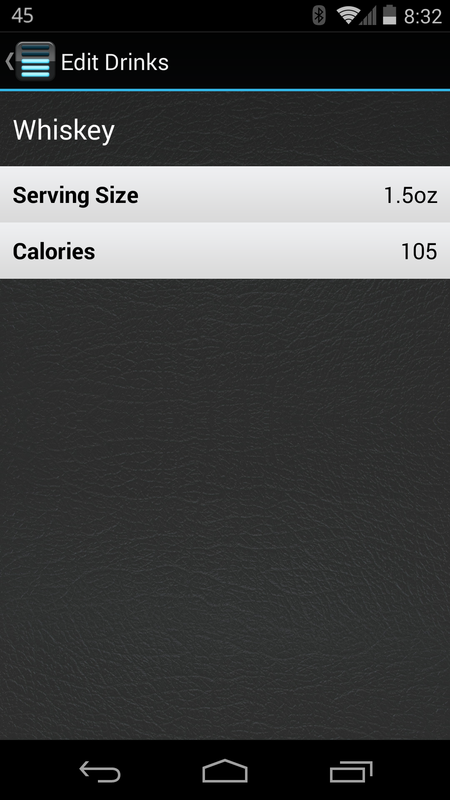 There are also options to add pictures to your reading, document what you were drinking, and add notes. See, now there's an easy way to remember what happened while you were intoxicated. There's a map at the bottom but I don't want some crazy stalker type showing up at my front door so I blurred it. 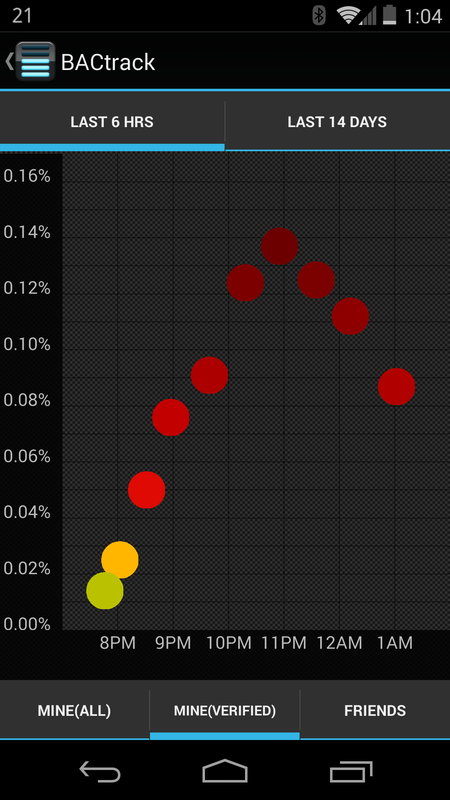 Because graphs and charts are cool and useful, BACtrack also charts your drunkeness throughout the course of the night. It shows the chart in six-hour increments, which is kind of annoying, because I wanted to be able to slide over just a little bit and see my entire graph on one page. 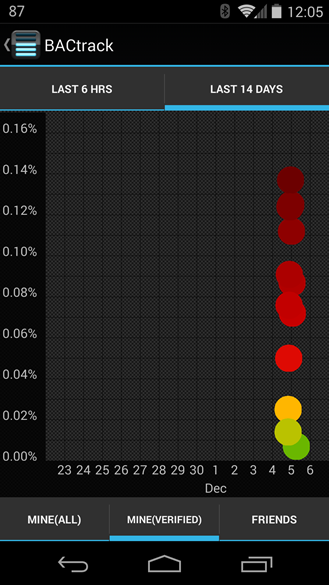 Unfortunately this isn't possible, as it only show pre-defined times per page. Thus if you don't start drinking till say, 9PM, half of your graph will be on one page and the other half on another. There's also the option to see your drinking habits over a two-week period. I don't personally drink very often at all, so this option doesn't include a lot of info for me. If you casually have a few drinks in the evening or drink a few times a week, however, this could really give you some insight as to how intoxicated you're actually getting. The results may surprise you. 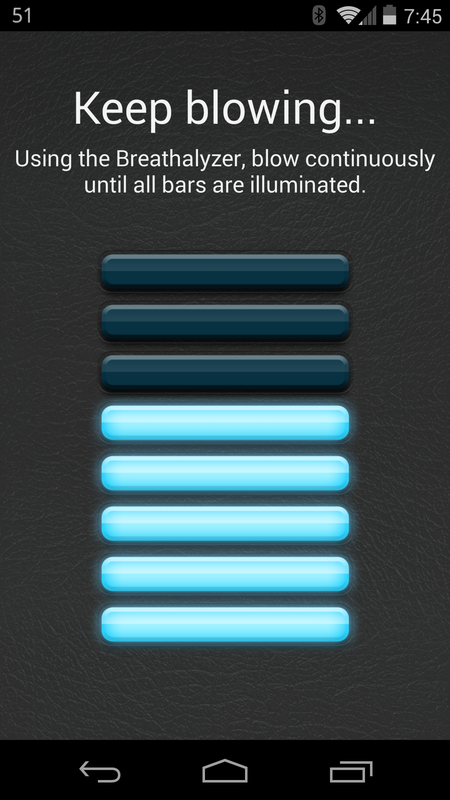 And then there's the social aspect of the app. 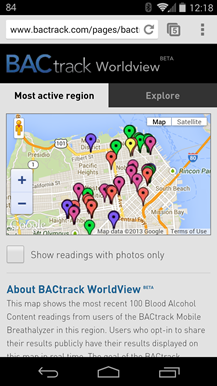 You can share you results over social networks like Facebook and Twitter, but there's actually a pretty cool way to see other BACtrack users' results in the Worldview option. You can elect to share your results publicly (the app automatically assigns you a generic username for sharing purposes, this can be changed if you like), find other BACtrack users in your area, or see the "most active regions." The results here can be pretty terrifying – just take a look. I hope the guy (or gal) from the third shot is OK. He or she was in danger of dying. Of course, it's worth noting that these results could likely be "spoofed" by not waiting for the 15 minute window to pass and some users may try to see how high they can get the numbers just for pure shock value. 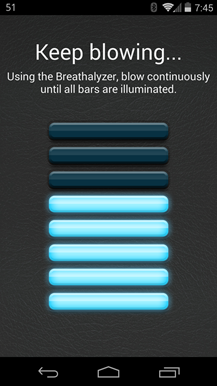 While I realize that everyone is responsible for their own actions and should be capable of exercising restraint, I wish there were a way to set some sort of user-definable warning zone in which the app could either tell you to stop drinking or display a personalized message. Most people may not listen (thanks, bad judgment! ), but it would still be a nice touch. I think I'd probably listen to my own warning. Maybe. Actually, probably not. Still, I'd like to have the option to find out. Beside a quarter. For scale. It's bigger than the quarter. Overall, I had a lot of fun testing out the BACtrack. 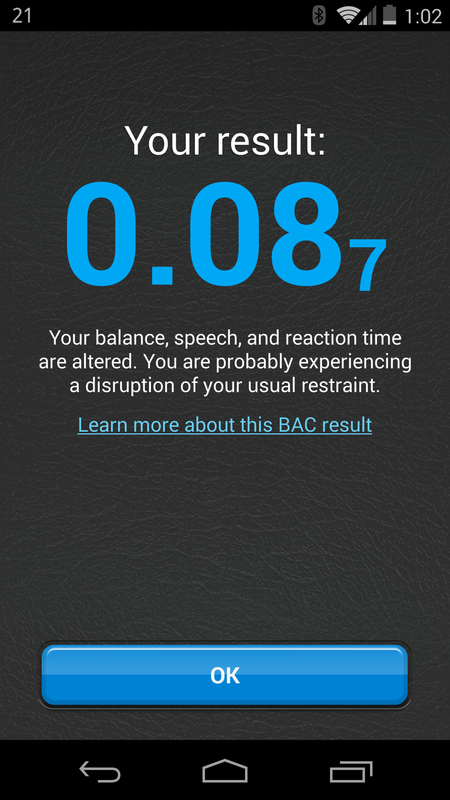 It was nice to actually be able to quantify blood alcohol content (without having an officer of the law do it), and really gave me some insight into how much alcohol is a reasonable limit for me. 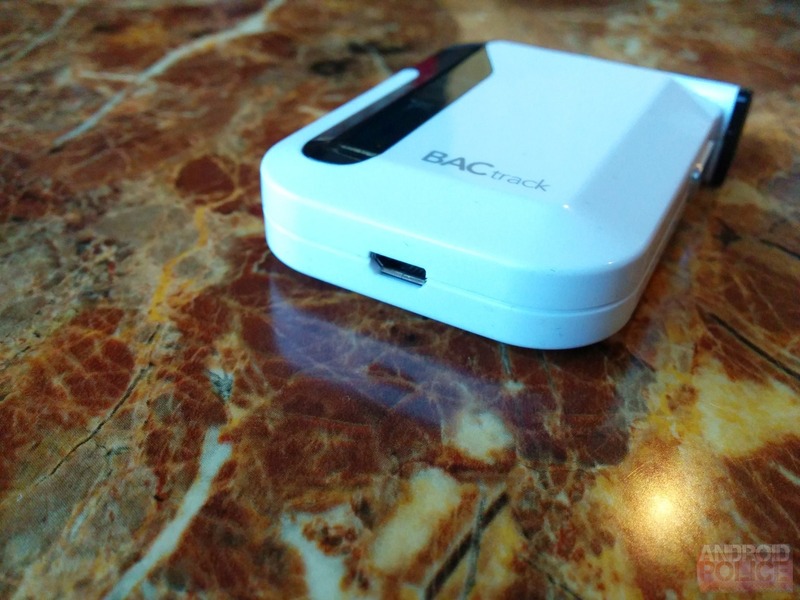 Whether you're a casual drinker or connoisseur of all things adult-beverage, the BACtrack is actually a really useful tool for a night out (or at home, whatever). It worked extremely well throughout my testing, and is simple and intuitive enough that it's still usable even if you can't stand up on your own. 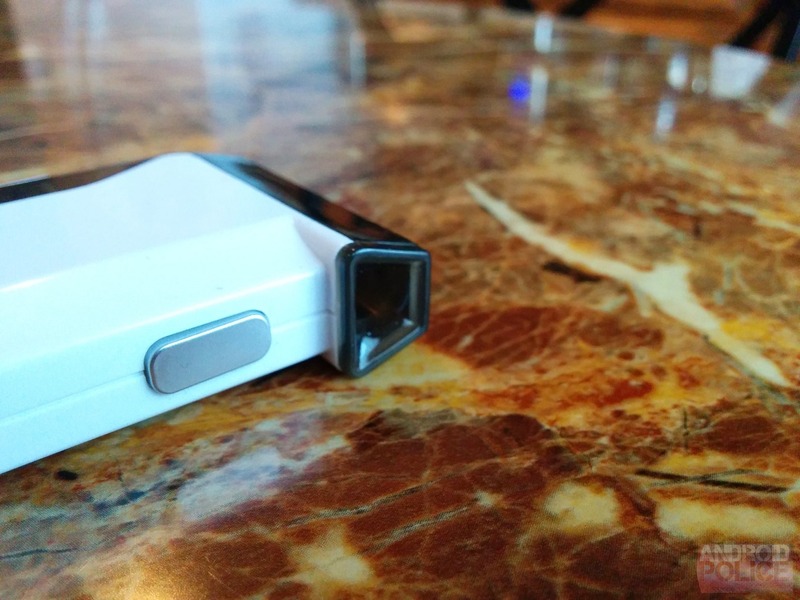 At $150 it's not what I'd call "cheap," but it's the first device of its kind and these guys have 10 years of experience making breathalyzers under their belt. Hell, it even won Popular Science's Best of What's New Award. If you'd like to find out why, head below to grab one for yourself.